Transferrin is a glycoprotein with homologous N-terminal and C-terminal iron-binding domains that binds up to two Fe(III) atoms for delivery to vertebrate cells through receptor-mediated endocytosis. Transferrin is a glycoprotein with homologous N-terminal and C-terminal iron-binding domains that binds up to two Fe(III) atoms for delivery to vertebrate cells through receptor-mediated endocytosis. After binding to its receptor on the cell surface, transferrin is rapidly internalized by invagination of clathrin-coated pits with formation of endocytic vesicles, the acidic environment favors dissociation of iron from the transferrin-receptor complex. Following the release of iron, the apotransferrin is recycled to the plasma membrane where it is released from its receptor to scavenge more iron. Human transferrin is labeled with our bright and photostable CF® dyes for investigation of endocytosis by microscopy. Download the product protocol to view the full list of conjugates and their excitation/emission wavelengths. 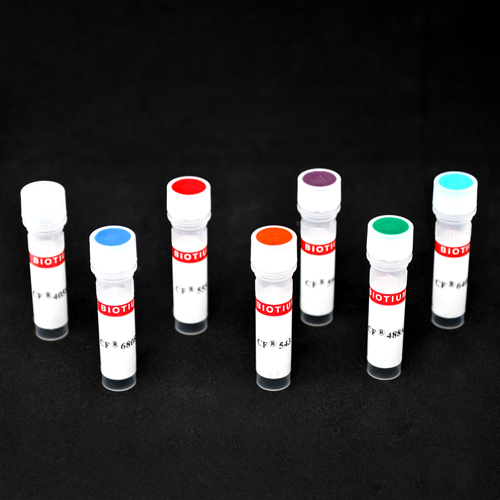 It’s available with the following CF® dyes: CF®488A, CF®543, CF®568, CF®594, CF®640R, CF®680R, and CF®750. CF®488A-cAMP and CF®640R-cAMP are fluorescently labeled cAMP analogs. Single molecules of fluorescently labeled cAMP have been imaged bound to the cAMP receptor on the surface of Dictyostelium cells (1).